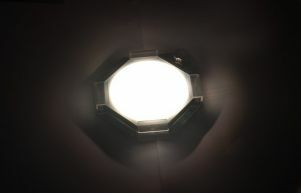 The kind folks over at Osram has sent us one of their new ORBEOS OLED Lighting panel for a review. The ORBEOS is a round (88mm diameter) glass panel that's only 2.1mm thick (it weights 24g). The efficiency is 25lm/W. 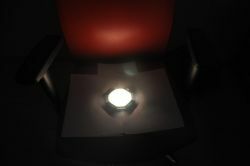 The brightness of the panels is 1,000cd/m² with power input of less than a watt, and they should last around 5,000 hours. 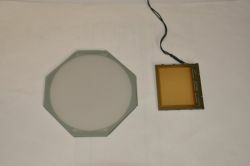 The panels are available now via OSRAM's site, they cost €240 each. 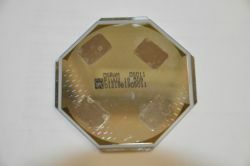 The panels were actually released back in November 2009, and OSRAM say that they are happy with the sales and interest so far. 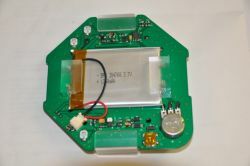 The ORBEOS come in a small box which contains the panel inside the 'development kit'. OSRAM has done a great job at this I think, it's very easy to handle. It has a battery (it even comes charged) and it charges via a USB. So what you basically get is a large OLED flashlight. The kit contains a dimmer and an on/off switch. You can easily take the panel out (there are four plastic caps on the sides, you just have to remove them). 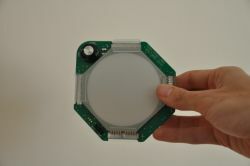 OSRAM say that it's important to return the panel in the right direction - to the minus and plus connectors on the kit. Obviously I didn't read the instructions before playing with it, so I can say that I did return the panel facing the wrong way and tried to switch it off. It didn't work, but it didn't seem to harm the panel. Don't try this at home, anyway. 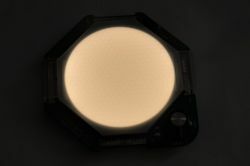 The ORBEOS emits a warm white light (2,800K, CRI up to 80) like an incandescent lamp - somewhat yellowish. You can't actually dim the light all the way... there's a large cut-off between "on" and "off". A bit annoying, but maybe that's the kit design, as the panel itself should be "continuously dimmable" according to Osram. The ORBEOS has a honeycomb wire structure to the panel - this is visible in both the off and on state. I can say that even after working for several minutes, it doesn't get hot at all. 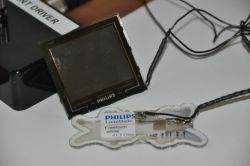 This obviously one of the advantages of OLEDs (interestingly Philips' panel got very hot). Both panels are rated at 1,000cd/m², and indeed both seem just as bright. 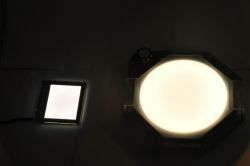 The ORBEOS is much larger than the square Lumiblade I've got (which is 43.7x47.4 mm) and so it's brighter of course. The Lumiblade is white ('cold' white) while the ORBEOS is more yellowish. Like I said before, the Lumiblade gets very hot while the ORBEOS stays cool. 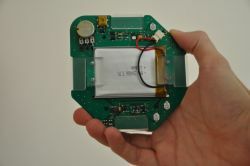 I think that OSRAM has done a great job on this OLED development kit. It's very high-quality, and it's exciting to handle one of the world's first OLED panels: you know you're holding the future of lighting... 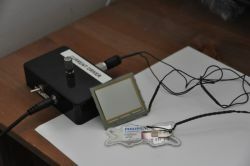 If you plan to get a few and use them in a lamp design, you have to understand that you'll need to build a controller of your own if you want to enjoy the thinness of the panels and get rid of the bulky kit. The ORBEOS panels are very expensive (€240 each) but these are just samples - they are not yet mass produced. They are not very efficient either: 25lm/W is much less than a fluorescent (which is usually 60 to 90 lm/W). Obviously this is just a first step, as companies already announced OLED panels that exceed 100 lm/W in the "lab".